This is a nice combination of colours with the dominant one being Prussian Blue. Its little wonder the overall colour of the painting is this strong bright blue. From a distance the blue would seem too much but I found as I enter this blue landscape it seems natural. I think this illustrates the importance of including a ‘spectrum’ of colour in a landscape. I will always have the red, yellow and blue represented by colours which fit into these groupings. In this painting the blue skewed the colour into the blue end of the ‘spectrum’ and this is OK if there are yellows and reds there as well. How different this is from a ‘monochrome’ painting where a single colour only is used. An popular example of this type of painting are sepia sketches. No matter how ‘realistic’ the rendering, the element of ‘real world’ is not there. We are always conscious we are viewing a ‘drawing’. This means I will never have less than three colours in a painting. With so few colours its important to know which colours ‘fit’ well together. Its only with experience that these combinations can be worked out. Not only must they look well together but they must also mix well together. An example of this is Indian Red. Its a brilliant rust red in the tube. But all mixes with this colour produce ‘dirty’ colours. Burnt Sienna is a similar colour, but the mixes are clean. 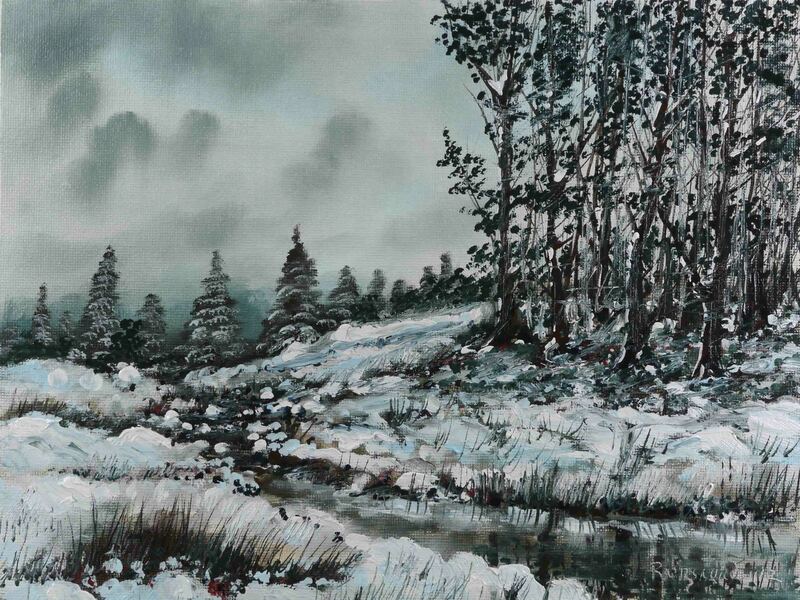 In this painting the grey of the clouds is made from a mix of Burnt Sienna and Prussian Blue. The resultant grey is clean and vibrant enough for fluffy clouds. In this painting I used my usual method of applying unmixed paint, with White Spirits only, to the canvas before the final colours are overlaid. Actually, now all the paint is applied with White Spirits only (see recent posts about excess oil in paint tubes). The difference is that unmixed paint, straight from the tube, is transparent and in its raw state is as vibrant as the colour will ever be. This layer of unmixed paint is good when deciding the structure the painting will take. Its like colouring the initial charcoal drawing. Although this layer of paint will mostly be covered up, it has an enormous effect on what happens later on. Knowing the ‘coloured sketch’ will be covered allows experimental shapes and ideas to happen. Even in the blue gradient of the sky, the initial blue erratic shapes add interest and variety to an otherwise dull flat final layer. I will often under paint in the opposite colour to the final. For example, in the areas I knew were going to be snow in shadow (very light blue) I under painted in Raw Umber. This moderated the later light blue paint by slightly mixing with it, and any parts not covered by this ‘snow’ had ready-made deep shadow or vegetation. The colours used were Burnt Sienna & Raw Umber (red part of spectrum), Raw Sienna (yellow) and Prussian Blue. As always black and white are there too, but they are not considered as colours. The painting took about two hours over the course of a Sunday afternoon. The weather is so cold now, the excess solvent I use is taking a long time to evaporate. So a two hour painting stretches to four hours. I will post the video soon. See you then. This started out as a subject for a Christmas card. Now I think its a little too ‘gritty’. The composition strays too far from the ideal, non challenging one third ‘point of interest’ arrangement. Also the snow is just not ‘right’. As I said in previous posts, Christmas card subjects are difficult to define. 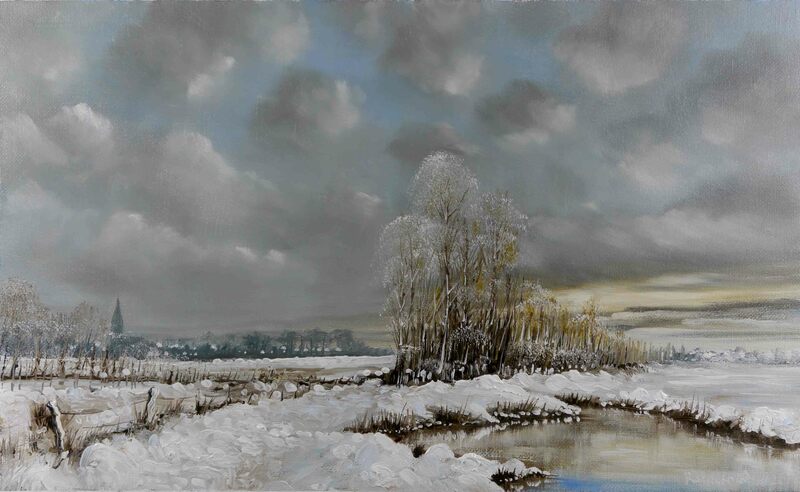 I might change my mind about this painting in a few days, at the moment its just plain old nasty winter. The colours I chose were possibly a little ‘rough’. Indian Red was in there with Burnt Umber to make up the red part of the spectrum. If you want a difficult colour, Indian Red is a contender. Its a strong red in mixes to a point, then at lower concentrations collapses into a dirty grey brown. 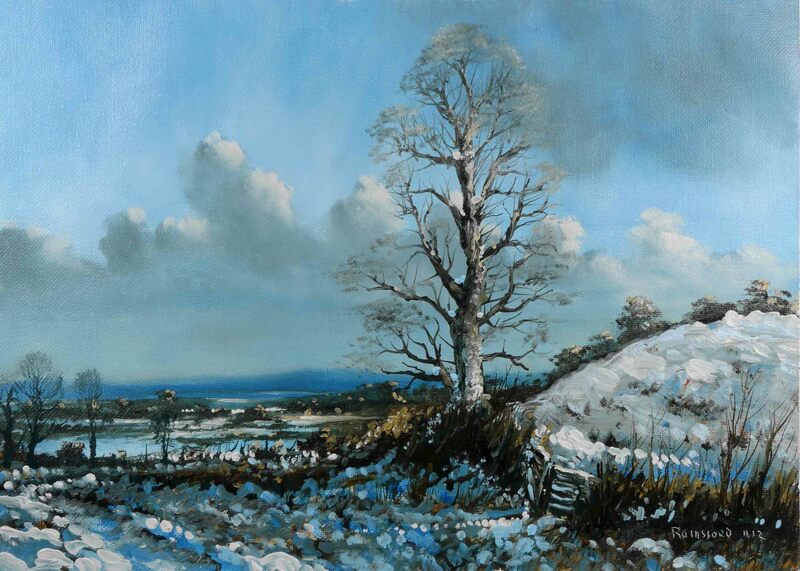 Prussian Blue is also a strong tinting colour, good for shadows in snow. The yellow was Raw Sienna a golden yellow, which in this painting was dominated by the other colours. So maybe I was expecting too much from this combination. I’ll post the video of the painting process in a day or two. You will notice I’m still not using any medium. Recent paintings done like this should dry very matt and dull, but this is not the case. Confirming what I think, that recently manufactured paint contains more medium in the tubes than was the case a few years ago. See you soon. The second in the series of Christmas card subjects. This is an amalgamation of three scenes with a sprinkle of snow to produce a Christmas subject. Each piece would be recognisable in isolation, so it will be ‘familiar’ to many people from this part of the world. But this does not matter, its the ‘feeling’ of Christmas that’s important. I’ve been thinking about what are the essential ingredients in the effective Christmas scene. Time, or the passing of time is important. To quote John Lennon “Another year over. And a new one just begun“. Its the time we stop and think about how quickly things move on, leaving so much behind. Like childhood, parents, grandparents, ancestors. The above photo does not convey the very subtle colours in the colouring of the snow. It will be a challenge to print this scene as a card, but it will be Ok, I hope. As you will see in the video in the next post I don’t mix these colours on the palette. Instead I place layers of colours where the snow will be. These are thin washes (in solvent) of paint. When the solvent evaporates, pure white is rubbed into these colours picking up and mixing with what’s there. The more the paint is manipulated the deeper the resultant colour. The shadow areas have a ‘blueish’ tinge and the lit areas are a warmer yellow/brown. The final highlights are ‘blobs’ of white with little or no blending or mixing. There is one little problem with this method. The ‘blobs’ are three dimensional and sometimes very much so. With the textured paint I allow the ‘skin’ of the paint to dry and flatten down the paint with my finger tip. Featureless ‘spikes’ I will shave off when dry enough. The colours used are: Burnt Sienna (red), Raw Sienna (yellow) and Cobalt Blue. No medium, solvent only. I will have the video in a day or so, see you then. As I mentioned in the previous post, I painted this picture as a subject for a Christmas card. I do a few every year and have them printed as cards. The subject is so specific and seasonal, its totally ‘out of place’ any other time of year. A winter painting is different. Even in summertime it can be viewed and enjoyed. But the Christmas card subject seems almost ‘tacky’ by the first of January. So what is the critical ingredient in the Christmas card? There are the obvious ‘illustration’ type of images, holly, robin, santa, Victorian images, etc. However, a realistic landscape has to rely on all year round objects, jumbled into an arrangement which conveys the feeling of Christmas. I don’t have a formula for subject matter appropriate for this season and its difficult to say what works or not. Of course I try and plan and ‘create’ the look, but what it is, is difficult to tie down. All I know is that after the celebrations are over and we are thinking about the new year, the painting is packed away for eleven months when it becomes appropriate again. 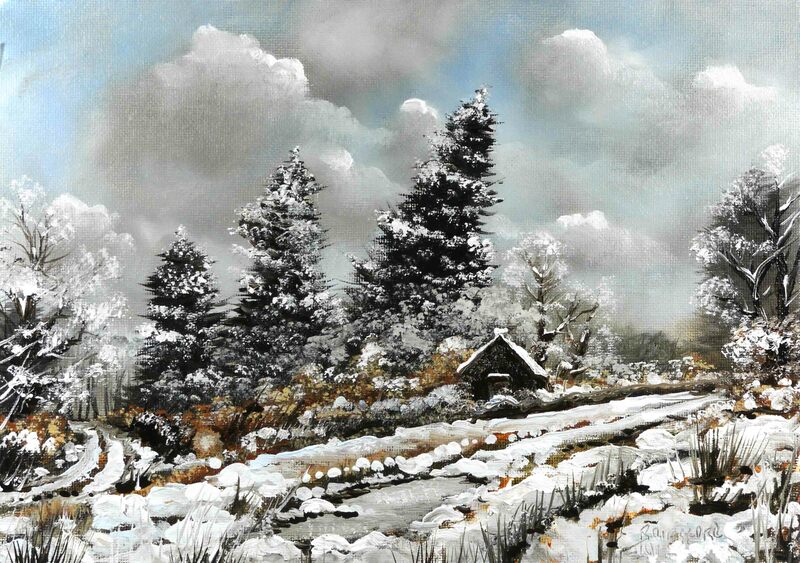 I will of course do a few ‘winter’ paintings, usually without snow, and as I said before, they will be ‘useable’ any time of the year. Here is the video of the painting of this picture. I have just completed another ‘card’ and will post it in a day or two. See you then.